In 2015 I embarked on a project at The Bike Station, to create an extension of Dr Bike, attempting to empower the general public and demystify the technicality of bicycle maintenance. Sound familiar? Demystification is something I have been into for a while, though I hadn’t really taken it into the realm of infographics before. The 2015 media was printed as 3 distinct Z-Cards which worked well, but lacked the media push to make them truly public. This year we decided to revamp the Z-Cards adding a fourth, for symmetry. Professor Chris Oliver, Scotland’s premier hand surgeon and epic ambassador supreme of cycling social media and the link between science, medicine, politics and enjoyment, offered his support in writing material for the 4th pamphlet, in exchange for being able to share the media with his 17.3k Twitter followers. A pretty good deal all round. Downloadable versions of the printed material are here: drbike1 drbike2 drbike3 drbike4 And on The Bike Station’s website. The printed material will be available from The Bike Station’s 15th birthday (and having recycled over 50 000 bikes), this coming Saturday 22/10/16. 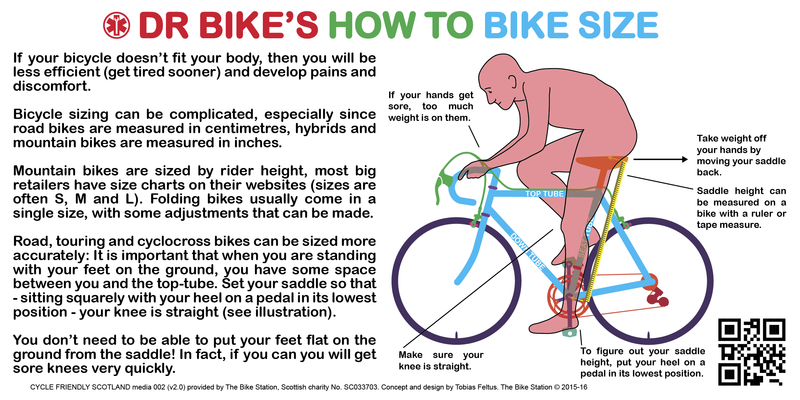 Breaking these into around 40 Twitter friendly infographics has opened the possibility for the media to be expanded gradually, and my next additions will add a series on “family friendly” cycling – trainers vs balance bike, kid’s seats, trailers etc… And addressing different aspects of comfort on the bike, possibly with some tips from Douglas Shaw at Edinburgh Bike Fitting. Saddles, their differences and their comfort. Underlying physical imbalances. Ape-factor (relationship between upper body and lower body length) and how this can often leave you with a bike that is too big… I think there is a lot that can be put into writing and shared with #DrBike which will help people understand things that will help improve their experience of cycling and – in the long run – bring more active business to the industry.